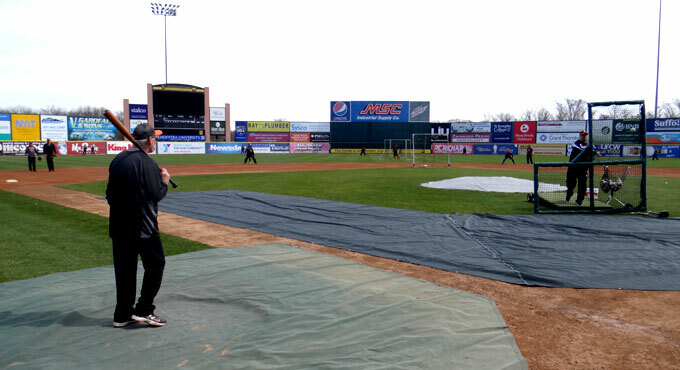 (Central Islip, N.Y., April 13, 2015) – The three-time Atlantic League champion Long Island Ducks took the field for the first time in 2015 on Monday to begin their Spring Training workouts. The team’s 16th season of play in the Atlantic League of Professional Baseball begins on Friday, April 24 in Pennsylvania against the York Revolution at 6:30 p.m. Long Island’s home opener will follow on Friday, May 1 against the Sugar Land Skeeters at 6:35. The team’s workout included batting practice, fielding practice, live throwing sessions for pitchers and conditioning. The day also featured each player and coach taking photos for inclusion in the team’s Media Guide and Commemorative Yearbook, which will be available for purchase beginning May 1. The spring training game schedule will include four exhibition games in preparation for the regular season. Featured first will be a home-and-home series against the cross-sound rival Bridgeport Bluefish, and those will be followed by two contests against the semi-pro Long Island Black Sox (complete schedule below). Admission to the exhibition game on Saturday, April 18 will be free of charge as part of the team’s Third Annual Fan Fest taking place that day, and gates will open at 10:30 a.m. CLICK HERE or call (631) 940-3825 to find out more information about Fan Fest. The games against the Black Sox will be free for season ticket holders and a $5 donation to the QuackerJack Foundation will apply for the general public. Long Island also announced the signing of outfielder Trayvon Robinson on Monday. He begins his first season with the Ducks and in the Atlantic League. The former Major Leaguer spent time in 2011 and 2012 at the game’s highest level with the Seattle Mariners. In 90 games, he compiled five home runs, 26 RBI, 28 runs, 16 doubles and seven stolen bases. His first Major League hit was a single off of former Atlantic Leaguer Jered Weaver, and his first big league home run was a solo blast off of Tyler Chatwood. The 27-year-old has played 10 seasons of professional baseball. He played the entire 2014 season with Triple-A Albuquerque in the Los Angeles Dodgers organization, totaling six home runs, 30 RBI, 23 doubles and 11 stolen bases in 117 games. The Los Angeles native was named an All-Star in three consecutive seasons (2009-11) as well as an MiLB.com Organization All-Star with the Dodgers in 2010. Robinson was originally drafted by the Dodgers in the 10th round of the 2005 amateur draft. The Ducks also welcomed four players as non-roster Spring Training invitees this year. They include pitchers Bruce Kern, Matt Soren and Frank DeJiulio as well as outfielder Anthony Vega. Kern has played five seasons of professional baseball, all in the Colorado Rockies organization. The Stony Brook native reached as high as Double-A Tulsa in 2014. Soren has two seasons of professional experience, and the Roslyn native reached Single-A with the Philadelphia Phillies in 2013. DeJiulio hails from Florida, and he has played two seasons of pro ball in the Los Angeles Angels organization. Vega has three seasons of professional experience in the Baltimore Orioles organization, and the Patchogue native played all three years at the Single-A level. Individual game tickets for the 2015 season are on sale now. The home opener will take place on Friday, May 1 as the Ducks take on the Sugar Land Skeeters at 6:35 p.m. Gates will open at 5:35, and the first 1,500 fans in attendance will receive Lew Ford Bronze Figurines, courtesy of P.C. Richard & Son. Prior the game, in addition to traditional Opening Night pomp and circumstance, the team will hold a special ceremony to present Ford with his 2014 Atlantic League Player of the Year award. Tickets can be purchased at the Bethpage Ballpark Box Office, by calling (631) 940-TIXX or by CLICKING HERE. Season tickets, 10-Game mini plans and group outings are also currently available by calling (631) 940-3825.